Linoleum is not an initially solid product. It's made primarily from linseed oil. The oil is mixed with cork or sawdust and then heated and pressed into shape. It's naturally clear. Patterns and colors in the form of pigments are pressed into a solid backing while the linoleum is still hardening. It's hardened and cured with rubbing alcohol and then cut into shape for household use. Linoleum is a cheap floor covering that's easily installed and is constructed from renewable resources, but it can have some problems with coloration because it's made from a chemical that's a liquid in its natural state. What is linoleum made of? What causes linoleum to turn yellow? Linoleum is naturally colorless. The backing beneath the transparent layer is what we typically see as the color. It is the transparent layer that can take on a yellowish hue. There are several reasons for this. The linseed oil from which it is made reacts with high doses of UV light over time to produce a yellowish pigment. This is why linoleum that's left in the sun yellows quickly. Also, because the materials that make up linoleum are acidic in nature, they will react badly with any cleaning products containing alkaline chemicals. Ammonia would be the most immediate alkaline commonly found in floor cleaning chemicals that causes this. Linoleum in bathrooms around toilets can become yellowish because of the high amount of ammonia in human wastes. Acetone is a good solvent that is neither acidic nor basic, meaning it doesn't interact harmfully with linoleum. In cases where the yellowing is caused by surface contact with harmful chemicals, acetone can be used to remove the outermost yellow layer of material. The layer immediately underneath should be transparent, returning the linoleum to its original appearance. 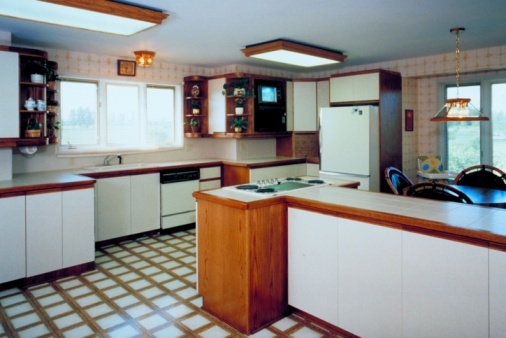 In cases where the yellowing is more severe, typically the result of UV radiation, the linoleum must be abraded away until an unyellowed layer is uncovered. To keep the flooring even, this must be done across the entire floor, not just the yellow spots. A belt sander with fine graded sandpaper should be up to the job. Afterward, the floor must be polished with a floor buffer and waxed to remove any scratch marks and return the surface to a shine. It should be noted that on some occasions the yellowing goes all the way down to the solid-colored backing of the linoleum. 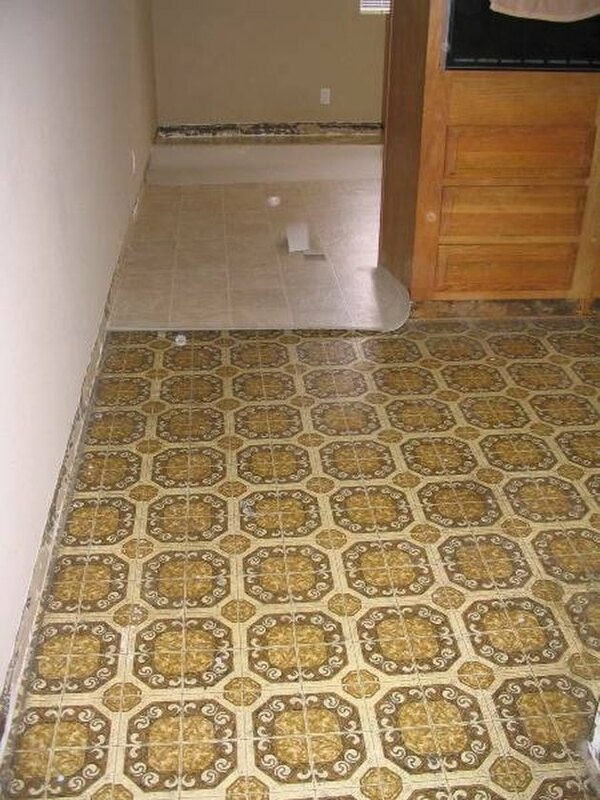 In these cases, the only option is to replace the linoleum altogether. Whether this is necessary is not something that can be determined until one has sanded down through the linoleum until the backing is reached.